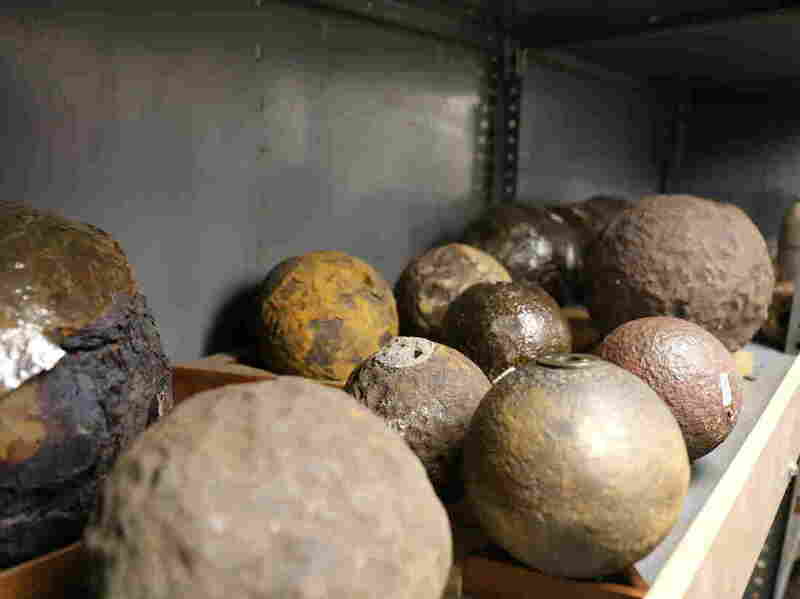 In Charleston, Cannonball Discoveries Are Constant Reminders Of Past Wars Relics from the Revolutionary War and the Civil War are creating all sorts of problems in South Carolina. Old cannonballs continue to be found, and many need to be detonated. A row of recovered cannonballs in the Charleston Museum. The Revolutionary War and Civil War are in the distant past, but their remnants continue to be problems today. In Charleston, S.C., cannonballs from those wars wash up on beaches or are found underground regularly. And while some are benign pieces of history, others have the potential to explode and military bomb experts are called in to detonate them. Detective Carl Makins, with the Charleston County bomb squad, says a lot of people don't understand how dangerous these cannonballs are. He, along with Grahame Long, the curator at the Charleston Museum, get several calls a year that an old relic has been found. The museum has over 200 cannonballs, but Long can't even display them all. Recently, he's received some small, avocado-looking iron balls from the Revolutionary War. And because the Union siege of Charleston lasted more than 500 days, it's common to find Civil War-era remains of the constant bombardment. "On any given day [during the siege], there are several, if not dozens of shells coming into town. Some going off, some aren't," he says. "And these are heavy, heavy pieces going far distances, hitting the ground hard and getting buried." In fact, Long believes only a fraction of the cannonballs have been unearthed. He expects they'll be found here for years to come. Alexandra Olgin is a reporter with NPR member South Carolina Public Radio. You can follow her @Alexolgin.